In 2015, ProQuest conducted a study on researchers’ use of news resources. This is the first in a five-part series focused on the study results and use of news resources in research. We all love a good story. And storytelling has been the medium by which humans have passed on information from generation to generation across cultures and civilizations. Today, we consume stories from multiple mediums. At a typical start of the day we turn to news to keep up with ongoing events or discover what happened overnight. The newspaper, as a medium of storytelling, has persisted even as more and more ways to create and consume news have developed. In academic research, the use of news content as a primary source has grown in popularity and is the second most relied upon type of content after scholarly journals. A ProQuest study of how humanities researchers use news resources in their dissertations and theses showed a 40% increase in usage per year for three consecutive years. In fact, looking across all content types during a nine month period in 2015 revealed that researchers choose news full-text articles nearly 30% of the time to support their research projects. The appeal for users of online library resources is that, rather than going to individual news sites, they can access thousands of news sources via one search interface. They can conduct research quickly, narrow results and retrieve the citations they need. So, why the rise in popularity of news resources at higher education institutions? 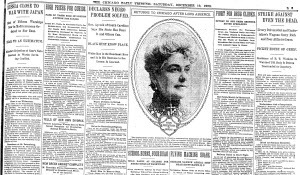 As a primary resource for stories, newspapers play an important role as they include eyewitness accounts to events that were told at a particular point in time. Having a description given by a person at an event, who they were with, how they felt in the moment and so on can provide details that are missing in other historical publications. 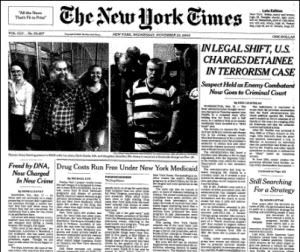 Newspapers provide researchers with a powerful snapshot in time. 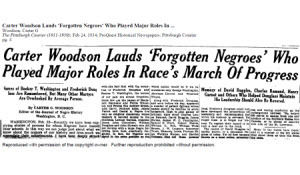 As a content source, newspapers also help researchers verify the dates of events, people, and organizations as well as trace the changing perceptions of issues over time. Researchers also appreciate the use of a good story as a way to tell their own stories and provide context for their opinions and findings. Writing compelling articles requires not only formulating convincing arguments supported by authoritative sources but also connecting the intended readers with a story and setting that resonates with them or compels them to take an interest. The personal intrigue of our past is also evidenced by the use of genealogy resources, particularly in public libraries. Genealogists identify a family member’s birthday or want to find out more about a relative and research historical news events during the relative’s lifetime. Libraries are a community hub for local history. For librarians supporting users, aggregation of regional news is important to researchers. Finding relevant information is easy with full-text searching. 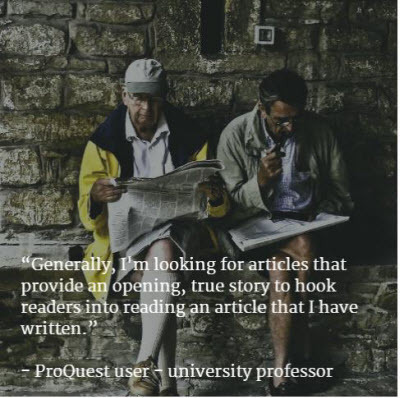 Next week, read more on ProQuest’s study of researchers’ use of news sources. We all love a good story. And storytelling has been the medium by which humans have passed on information from generation to generation across cultures and civilizations. Today, we consume stories from multiple mediums. At a typical start of the day, we turn to news to keep up with ongoing events or discover what happened overnight. The newspaper, as a medium of storytelling, has persisted even as more and more ways to create and consume news have developed. In academic research, the use of news content as a primary source has grown in popularity and is the second most relied upon type of content after scholarly journals. A ProQuest study of how humanities researchers use news resources in their dissertations and theses showed a 40% increase in usage per year for three consecutive years. In fact, looking across all content types during a nine-month period in 2015 revealed that researchers choose news full-text articles nearly 30% of the time to support their research projects. The appeal for users of online library resources is that, rather than going to individual news sites, they can access thousands of news sources via one search interface. They can conduct research quickly, narrow results and retrieve the citations they need.